Intrinsic value can be calculated by value investors using fundamental analysis to look at both the qualitative (business model, governance and target market factors) and quantitative (ratios and financial statement analysis) aspects of a business. This calculated value is then compared with the market value to determine whether the business or asset is over- or undervalued. The discounted cash flow (DCF) model is one commonly used valuation method to determine a company’s intrinsic value. The discounted cash flow model uses a company’s free cash flow and weighted average cost of capital (WACC), which accounts for the time value of money, and then discounts all its future cash flow back to the present day. The intrinsic value of call options is the difference between the underlying stock’s price and the strike price. Conversely, the intrinsic value of put options is the difference between the strike price and the underlying stock’s price. In the case of both call and put options, if the calculated value is negative, the intrinsic value is given as zero. 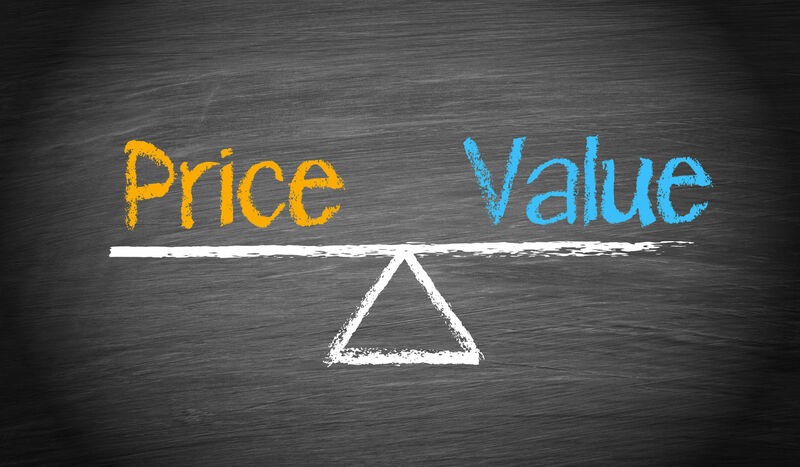 Intrinsic value and extrinsic value combine to make up the total value of an option’s price. The extrinsic value, or time value, takes into account the external factors that affect an option’s price, such as implied volatility and time value. Intrinsic value in options is the in-the-money portion of the option’s premium. For example, if a call option’s strike price is $15 and the underlying stock’s market price is $25 a share, then the intrinsic value of the call option is the stock price less the strike price, or $25 minus $15, so $10. Assume the option was purchased for $12, so the extrinsic value is the purchase price of the strike less the intrinsic value, or $12 minus $10, so $2. An option is usually never worth less than what an option holder can receive if the option is exercised. On the other hand, assume an investor purchases a put option with a strike price of $20 for $5, when the underlying stock was trading at $16 a share. Therefore, the intrinsic value of the put option is the strike price less stock price, or $20 minus $16, so $4; and the extrinsic value is the purchase price of the strike less the intrinsic value, or $5 minus $4, so $1. Now let’s assume that an investor purchases a put option with a strike price of $15 for 50 cents when the underlying stock was trading at $16. The strike price less the stock price, or $15 minus $16, is negative; therefore, the intrinsic value would be $0 because the option is out of the money. However, the option still has value, which only comes from the extrinsic value, the purchase price less the intrinsic value, or 50 cents minus $0, which is 50 cents.